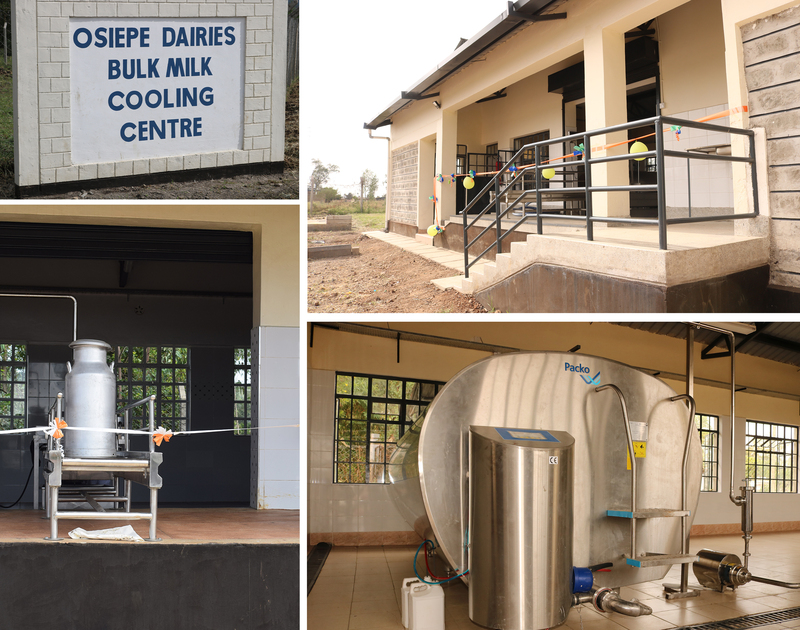 The AVCD project handed over bulk milk chilling and pasteurizing plants to cooperative societies of Kericho, Homa Bay, Kisumu and Makueni counties of Kenya in mid January and March 2019 (photo credit: ILRI/Meron Mulatu). The Feed the Future Kenya – Accelerated Value Chain Development (AVCD) program of the International Livestock Research Institute (ILRI) handed over three Bulk Milk Chilling Plants (BMCP) to the farmer cooperative societies of Kipkelion, Kasbondo Aim and Osiepe practical action CBO in Kericho, Homa Bay and Kisumu counties respectively in 14 and 15 January 2019. The project also handed over BMCP and pasteurizing factory to Kathonzweni dairy farmers cooperative society in Makueni County 15 March 2019. 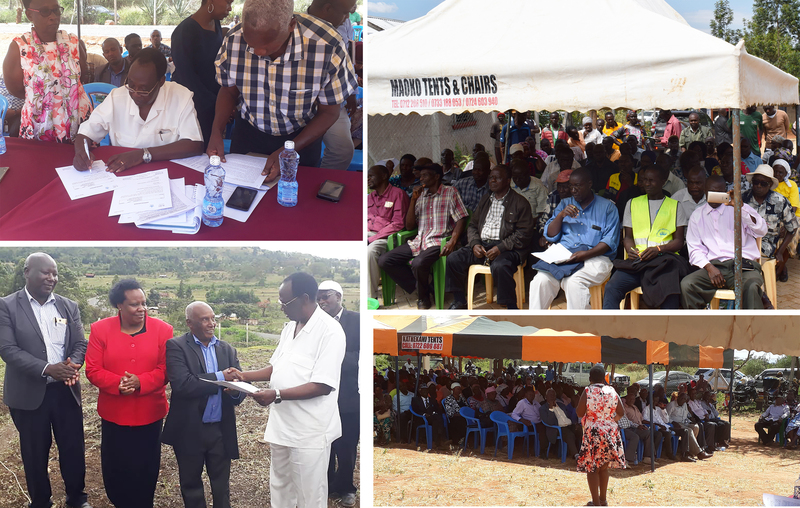 Members of the dairy cooperative society, county government representatives and AVCD staff members attended the event. These plants have the capacity to contain 5000 liters of milk each while the pasteurizing facility has a capacity of 10,000 litres of milk and are equipped with a chilling tank, generator, laboratory as well as milk collection container and offices except for Kathonzweni which also has pasteurizing and packaging facility. All meet the standard requirement in regard to availability of clean water, electricity and management capacity. It is believed that these facilities are game changers for the cooperatives especially if the farmers utilize them effectively. During the handover, Okal Okoko, secretary of Kasbondo Aim farmers’ cooperative society, said: ‘BMCP’s will definitely allow better preservation of the community’s milk production by providing an appropriate storage facility’. Rosebella Wereyera, a farmer and a mother of seven and a member of the Osiepe practical action cooperative, also said that she is going to benefit from this plant because she can easily transport her milk to the chilling plant and sell it to the cooperative with less hassle. A full-fledged member of Kasbondo AIM dairy cooperative society, Pastor Kenneth Maina mentioned that if a pastor can engage in dairy farming a church member can even do it even better. Handing over documents to the cooperative societies of the bulk milk chilling plants (photo credit: ILRI/Meron Mulatu). The county representatives and chairs of the respective cooperative society expressed their gratitude to the United States Agency for International Development (USAID), ILRI and other stakeholders involved to make this project feasible and their willingness to further assist in making the facilities sustainable by encouraging farmers to bring milk to the plants. AVCD through its dairy value chain component, works to achieve scaling up of dairy technologies and innovations in a whole value chain approach. This component is supporting capacity building of players in the dairy value chain to carry out dairy farming as a business through the development and operationalization of Dairy Business Hubs (DBHs), rolling out private sector led extension approaches, linking input suppliers to smallholder producers at grassroots-level and promoting the consumption of safe and nutritious milk and milk products. Tags: Dairy, ILRI, Kisumu, markets, Nutrition, USAID. Bookmark the permalink.